The American celebration of Thanksgiving is just days away. In almost any conversation next week people will inquire about your plans for celebrating the holiday and ask what foods will be on the menu. Every family seems to have a special dish. For one of my friends it’s a recipe for green Jello mixed with whipped cream. 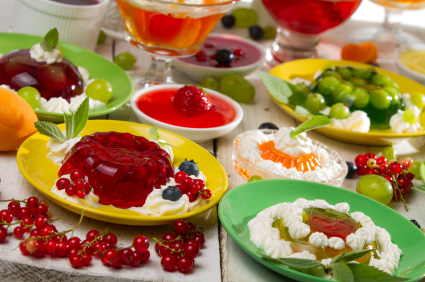 (Jell-O is a brand that has become the generic name for gelatin dishes.) In my family, the Jello is pink and the recipe is considered brilliant or odd depending on who you ask. Thanksgiving often seems as only an American holiday - one that is concerned mainly with sharing elaborate turkey dinners and beginning the holiday gift shopping period. It’s history as a harvest festival, a time to give thanks is often lost in the preparation of the meal and stress of travel to reach ones family. Certainly the idea that Thanksgiving takes places in other places is seldom considered. But around the world, there are other celebrations. In Korea the holiday similar to Thanksgiving is Chuseok. It is also a fall festival but one that lasts three days. It is a time to give thanks to ones ancestors for an abundant harvest. Traveling home, sharing food and drink are an essential parts of the celebration with a crescent shaped rice cake a traditional dish. There are also Thanksgivings, harvest festivals, in Canada, Germany and Grenada. In The Netherlands, Japan and Liberia. And in the Australian territory of Norfolk Island where the holiday tradition came via sailors on American whaling ships. No matter where you are, or what the holiday is called, its good to take a moment and remember to be thankful for the good things in our lives, enjoy the foods of the season and of the holiday.